The results of the New Mexico PARCC test were received by Gallup-McKinley County Schools in August. The data showed significant growth in student proficiency in test categories like English Language Arts, math and science. The results also revealed that GMCS was the No. 1 school district in New Mexico when it came to proficiency growth, with students more than doubling the state average. “This is history for Gallup-McKinley County Schools,” GMCS Superintendent Mike Hyatt said during the meeting. 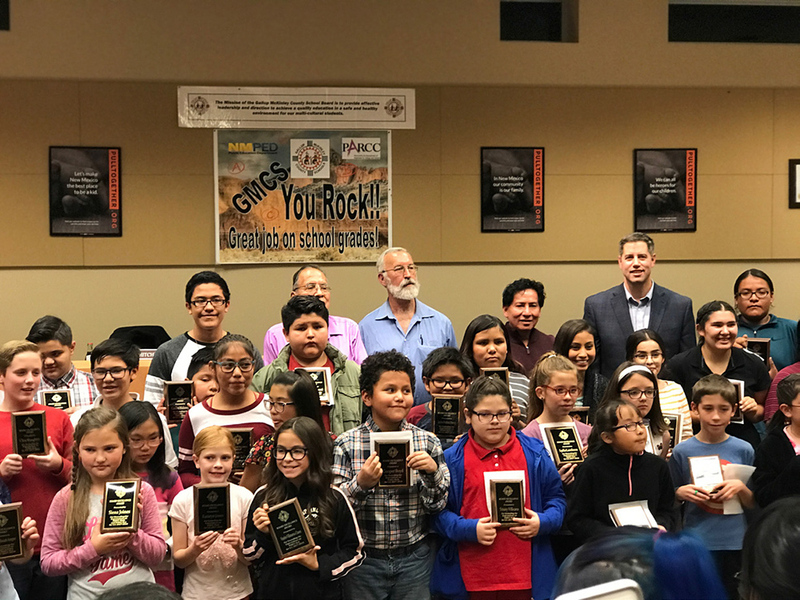 More than 100 students from GMCS were recognized by the school board at the meeting. Each student received a plaque with their name and the test categories in which they exceeded printed on it. 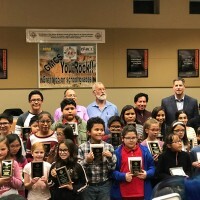 As the students were awarded for their achievements, Hyatt said the board had one request to make of the youths — namely, that they thank their families for their support. The rest of the school board voiced their appreciation for the students and their families, too. “We want you to continue to support your kids,” Board President Charles Long said. Once the students were recognized, they were asked to speak in unison. “I am GMCS!” they shouted. All of the consent agenda items, including contracts, school travel, financial budget changes, memorandums, donation and agreement termination, were approved with a 3-0-0 vote. Elizabeth Barriga of the City of Gallup spoke about McKinley County Water Awareness Day slated for April 2019. The event includes hands-on learning for students at locations like Red Rock Park, and Sandia National Laboratories to learn about proper water usage. Barriga asked that teachers speak about the event with students and urge them to attend the numerous events. Board Secretary Michael Schaaf nominated Charles Long and Board Vice President Chris Mortensen to serve on the budget committee. Both nominations were approved with a 3-0-0 vote. The Quitclaim Deed, which covers land where Sunnyside School resides, was approved with a 3-0-0 vote. Permanent cash transfers to the state Public Education Department were approved with a 3-0-0 vote.